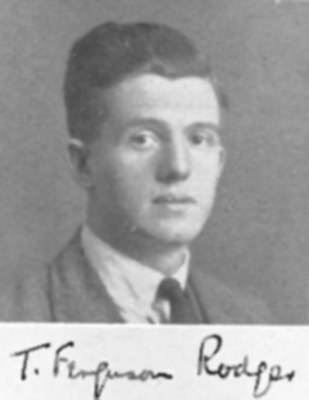 Thomas Ferguson Rodger (1907-1978) was the first Professor of Psychological Medicine at the University, 1949 to 1973. Born in Glasgow, Rodger attended North Kelvinside School and studied at the University, graduating BSc (1927) and MB ChB (1929). After completing his post-graduate medical training he became assistant to Sir David Henderson at the Glasgow Royal Mental Hospital at Gartnavel and to Professor Adolph Meyer at Johns Hopkins University. He returned to Gartnavel as the hospital's Deputy Superintendent. During the Second World War he served in the Royal Army Medical Corps until 1944 and then with the Army Medical Services in India as a consultant in Psychiatry. He became an international authority on the techniques of officer selection and personnel deployment technique and rose to the rank of Brigadier. Rodger returned to Scotland as Senior Commissioner to the General Board of Control. When he was appointed to the new Chair at the University in 1949 his department was based at the Southern General Hospital, and Rodger was instrumental (with the surgeon J Sloan Robertson) in establishing that hospital's reputation as a pioneer in combining Psychological Medicine and Neurological Sciences. An acknowledged leader in his field, Rodger was a consultant psychiatrist to the Southern General and the Glasgow Western Infirmary; Honorary Consulting Psychiatrist to the Army in Scotland; Vice-President of the Royal College of Psychiatry, and he served on Government and World Health Organisation committees. He was appointed CBE in 1967 and an Honorary Fellow of the Royal College of Psychiatry in 1972. Born 4 November 1907, Glasgow, Scotland. Professor Rodger and Edwin Morgan in Kiev, as part of the 1955 VOKS delegation from Scotland. Professor Roger giving his lecture ‘Some Observations on Mental Health Services in Scotland under the National Health Services Act’ to the Medical Institute of Kiev, 1955.